Teachers and pupils of the Happy Haven school celebrate Special Olympian Sapphire Jackson on her arrival, at a welcome reception, in the international departure lounge, of the ANR Robinson International airport, on Friday night. These were the encouraging words bestowed to Tobago’s lone athlete in the recently concluded Special Olympics 2019 World Games, 17-year-old Sapphire Jackson, who returned home, on Friday, to a hero’s welcome. It was jubilation, at the departure lounge of the ANR Robinson International Airport, as family members, supporters, well-wishers and friends hugged the Plymouth-born Special Olympic athlete after a successful outing in Abu Dhabi, United Arab Emirates, where she bagged two medals. 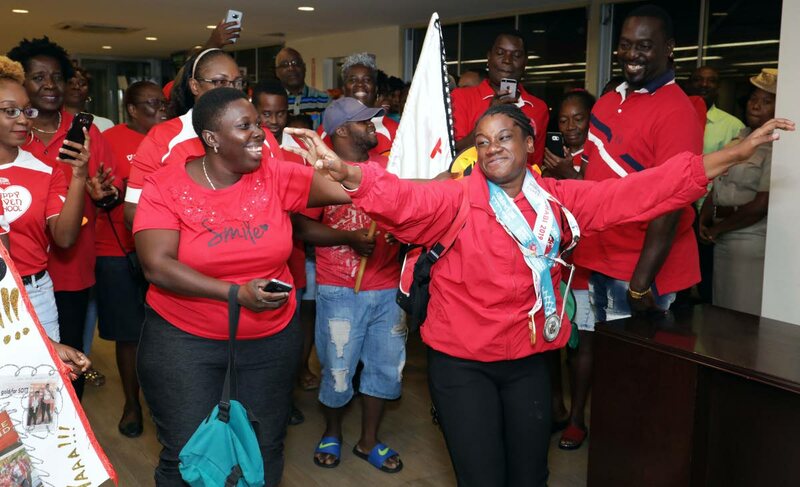 As she exited the Caribbean Airlines flight at 9.05pm, the athlete, donning her red track suit, ran into a packed lounge, where supporters and eager family members gathered in anticipation, cheering to the rhythm drums. Loud roars of approval could be heard as the athlete entered. Jackson won gold in the softball throw– an adaption of shot put – throwing 7.83m, while she doubled her medals at the games by grabbing silver in the 100m walk event in a time of 19.27 seconds. In a welcome reception, THA Chief Secretary Kelvin Charles, who also holds the portfolio of Secretary of Education, Innovation and Energy, hugged both Jackson and her mother Sandra Joseph-Brizan, as he expressed his delight at the showing. “Let me congratulate Sapphire for making all of us proud and we would want to continue... we would support you in your endeavours because you just can’t stop here. “What is significant is that Sapphire is the only Tobagonian among the contingent and the information I have speaks to 19 gold, 15 silver and she would have won one gold and one silver. In respect of a pro capita basis, she would have done exceedingly well. He added, “I also want to take this opportunity to continue to encourage all of us, because for us in Education and the THA, every child matters and it is principally for that reason that I decided to over work myself and to take on the arduous responsibility of Secretary of Education in addition to my portfolio as Chief Secretary. ... because of my passion for education and I recognise that education really is the key or the tool or the mechanism to ensure that we as a people are liberated but more importantly, that we are prepared to take on the responsibilities that are likely to come as we move to higher levels of self-Government,” he said. In response, Joseph-Brizan said she was eternally grateful that her hardwork paid off after playing an instrumental part in her daughter’s training. Joseph-Brizan urged parents to support their children. Dianne LeCointe, principal of the Happy Haven School, where Jackson is a student, said she was very impressed as Jackson made them quite proud. “Sapphire never took to sports initially, whenever the time came for physical exercise and at sport training ‘Safi’ would be the first to loudly exclaim ‘ah tired, ah want to sleep’. Nevertheless, the teachers continued to encourage and motivate her and gradually over the years her interest peaked and she began to participate. Over the last four years, Sapphire excelled in every national Special Olympic game where she secured only first and second places in her events. “Sapphire, we are proud of you and the team SOTT for representing our country with distinction, bringing back a total of 57 medals. Hats off to you my dear and we wish you continued successes. The Special Olympics athletes oath says, ‘Let me win but if I cannot win, let me be brave in the attempt’, Safi you did both, you were brave in your attempt and you won so thank you,” she said. Reply to "Jackson returns to hero’s welcome"